New Delhi, February 8: Congress chief Rahul Gandhi a challenge for a face-to-face, debate to Prime Minister Narendra Modi on national security, Rafale jet deal and the state of the nation's economy. The allotted time, he said, would be five minutes, But the Prime Minister, Gandhi added, is a “Darpok.” But the reality would be as clear as water when Gandhi himself would sit for 5 mins and recall what his party has done in the past 55 years for the country rather than ruining its soil. "I know PM Modi's character after fighting him for 5 years, he is a coward. When someone stands up to him, he runs away," Gandhi said. "I challenge the BJP; let Narendra Modi ji debate with me on stage. He is scared. He is a coward (darpok). I have recognised him," the Congress chief added to roaring applause from the party members he was addressing. This challenge comes after the questioning of his brother-in-law, businessman Robert Vadra by investigators in a money laundering case. 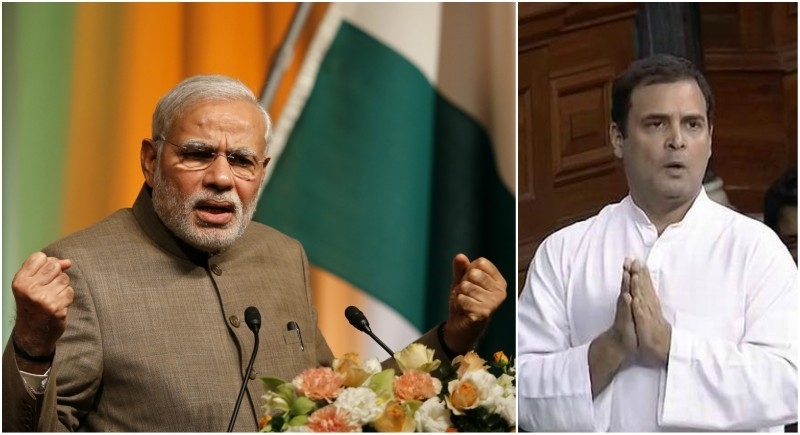 In Parliament, during his response to the Motion of Thanks, PM Modi questioned how the Congress could "say lies on Rafale with such confidence". "Then I realised because they know in all their years in power there hasn't been a single honest defence deal. Some mama, some chacha kept coming in," he said. The Congress, he added, was "insensitive" towards the armed forces, and did not wish to see it stand strong. "The Army has seen the days when the officers did not even have bullet-proof jackets to conduct surgical strikes... I am not talking about weaponry here. These are basic facilities," PM Modi said. The Congress chief has challenged PM Modi to participate in a debate with him in the past too. In November last year, Gandhi had challenged PM Modi to debate with him over the details of the Rafale deal.